Governor Palin’s PAC ended the year with a reserve of almost $1.2 million in the bank and no debt. That and the fact that fund raising continued toward the end of the year lends credence to Governor Palin’s promise to continue the battle for common-sense conservatism. With her Fox News days behind her, Sarah Palin is signaling she intends to become more involved in Republican primaries, and a Monday filing shows she has the cash to back it up. Palin’s leadership political action committee, Sarah PAC, finished the year with $1.2 million in the bank, according to a report to the Federal Election Commission covering roughly the final month of the year. Perhaps as significant as the cash on hand, Palin’s PAC has continued spending to build her fundraising list, which sources say contains about 100,000 addresses. The PAC paid $28,000 in December for fundraising related expenses including direct mail, online fundraising and thank you notes to donors, the report shows. And her endorsements — along with accompanying Sarah PAC donations — were welcomed by several tea party candidates who defeated more establishment candidates in GOP primaries, earning her allies in the GOP freshman class and signaling that she can still be a force in the conservative base. She was among the early backers of newly elected Sens. Ted Cruz (R-Texas), Deb Fisher (R-Neb.) and Jeff Flake (R-Ariz.) in their contested primaries, giving maximum $5,000 donations in their primaries, and then again in their general election campaigns. Cruz returned the favor after the election, publicly attesting to her impact in a grateful letter to her email list this month. After her breakup with Fox News, Palin told Breitbart News that she intended to broaden her outreach and become more involved in backing anti-establishment candidates. 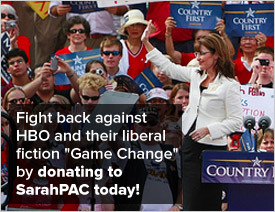 During calendar year 2012, Sarah PAC took in nearly $2.6 million in contributions, its reporting shows. This entry was posted on January 29, 2013 at 9:45 AM	and is filed under Uncategorized. You can follow any responses to this entry through the RSS 2.0 feed. You can leave a response, or trackback from your own site. It is our hopes to share, and also a goal at hand. Its a simple way to say, that We As A people are concerned where our Country, Economy, and lives are headed. Government Officials seem, to, not to hear the voices of the people. What I would offer, that I would ask, when that Person does step forward as the first Tea Party President Of The United States of America, research them, see if they have done as they said they did, a matter a fact research any one who now runs for any Office. Very encouraging news which gives us all hope that “our” cause is not a lost one! Go, Sarah, go – we’re with you all the way!! Great job Sarah. Thanks for Ted Cruz !! I am so glad that he won and for your can do and will do attitude to clean up DC.